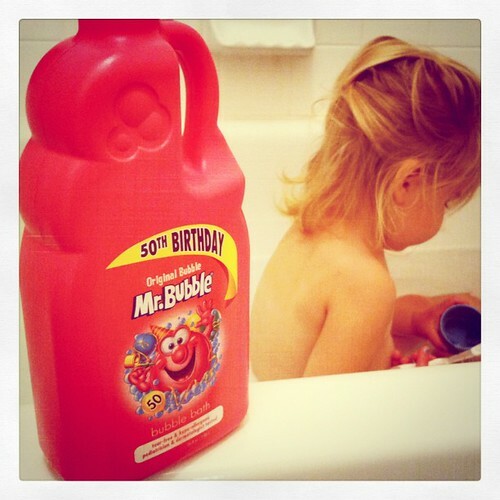 We finally got some bubble bath in our house. Brooklynn approves, very much. The first night we put in the bubble solution, she spent the first half of her bath reaching out with both hands, herding the bubbles toward by scraping the surface of the water with her arms, and softly saying, "Come here, come here bubbles" to herself. She rubbed them on her belly. She put them in her hair. She requests bath time. Bubbles are the new awesome. Without really having a specific reason, we got her some classic Mr. Bubble bubble bath. This is what I remember having as a kid. While it doesn't make me want to get in the bath with her, the smell certainly takes me back a few years when lathering up my face with bubbles and pretending to shave them off just like Dad in the morning was about the highlight of my day.